On the debut album – The Arrival (2002) – Finnish metallers Requiem showed potential and talent, with their mix of progressive and power metal style. Now, three years later, we already are presented with their third album. Since the follow up – many dubbed 2003’s Mask Of Damnation an unworthy sequel; a lot of hope was placed in this new album. Would this be the album that finally put Requiem on the map, along with the big boys or it would throw them into the crowded standard metal bands type? Well, let’s put it this way: if this were a debut album, I would consider it a good, promising album; since it’s the band’s third installment, I have to take it as an album issued by an already experienced band that should have taken more care with it. Let me elaborate a little bit. 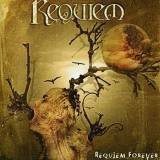 Requiem is a band that has some strong points: talent, good musicianship, a lead singer with a specific timbre and a good voice (disputed by many but enjoyed by yours truly), all these good arguments for standing out as a band. On the other side, we have some problematic production which makes the overall sound look a little bit rushed, some over the top vocals, the general feeling that I got out of the whole listening experience being that this album was released too soon, needing (in my opinion) at least a few more months to be worked on. Clocking at 43 min, the album is filled with catchy rhythms, speed riffs and nice melodic background keyboard sounds. By now, the band has switched to a heavy metal sound with traces of progressive (arrangements), neo-classical (guitar soloing) or even power elements in it. Most of the songs, though short, have good vocal harmonies, above average guitar solos and adept background keyboards. Jouni Nikula (lead vocals) does in general a good job, although he doesn’t have a very wide range, he uses his voice with good style, passing quickly from the deeper tones to the high ones, sounding at times like a younger Chris Boltendahl (Grave Digger); the main problem that I got here being the over the top high pitched vocals that are not suitable at all with his voice. Actually his best moments are on the early Iced Earth type of songs Invincible Enemy and Violate, with low tones and harsh shredding guitar sound. Good backing vocals from the other members of the band support his vocal lines. The guitar playing by Arto Raisala is the most affected by the sub par production, too often we find the guitar harmonies far back into the mix, the few times when you can actually listen to its clear sound is on the solo parts on The Tower, Shadowhunt or on the guitar/keyboard solo on Invincible Enemy. Of course, getting rid of Teemu Hanninen (second guitar) didn’t help at all with the overall sound. The album has its moment, with the enjoyable almost disco type chorus leaden Hold On, or the dual guitar driven The Tower, with very good choirs, or the keyboard oriented Sleepless Nights with its classic guitar playing. Despite the enjoyable tunes, most of them lack the necessary punch to turn them into powerful metal tunes. No wonder that one of the best tracks on the album is the closer Gods Of War that is a re-recording of a 1999 demo song. Featuring Lance Thruster on vocals (a powerful Ville ‘Sentenced’ Laihiala type of singer), the song is a powerful and aggressive yet melodic display of power metal. This album is a paradox. I cannot help but think what if these guys with all their talent and potential showed right from their debut would have had the opportunity to work with some of the best producers in the area. I really think that they need somebody who’s able to pull the best out of them and guide them along in their journey. Other than that, we shall only get enjoyable but lackluster albums and we shall lose whatever interest we had on this young and once promising band.